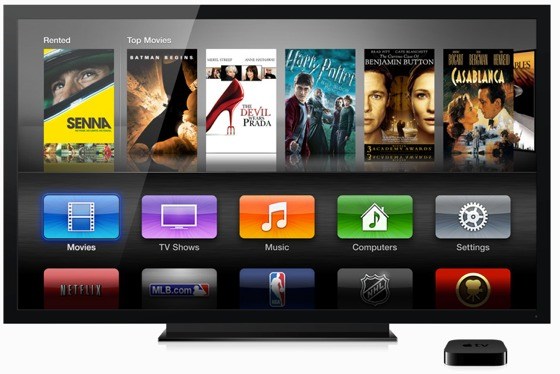 Apple has released Apple TV Software Update 5.1 for 2nd and 3rd generation Apple TV models. The release has build number 10A406e. The biggest changes include support for Shared Photo Streams, the ability to send audio content from the Apple TV to AirPlay-enabled speakers and devices (including AirPort Express and other Apple TVs), and the ability to switch between multiple iTunes accounts. Shared Photo Streams - Accept invitations for Shared Photo Streams, browse photos and comments, and receive notifications of new content. AirPlay - Send audio content from Apple TV to AirPlay-enabled speakers and devices (including AirPort Express and other Apple TVs). Also includes the ability to require an onscreen code to use AirPlay with your Apple TV. iTunes account switching - Save multiple iTunes accounts and switch quickly between them. Trailers - Search movie trailers. In the United States, see show times for local theaters. Screen savers - New Cascade, Shrinking Tiles, and Sliding Panels screen savers. Main menu - Reorder icons on the second page by holding down the select button on the remote. Subtitles - SDH support for the deaf and hard-of-hearing as well as improvements to viewing and selecting subtitles. Network configuration - Support for setting up advanced network options using configuration profiles. See http://support.apple.com/kb/HT5437 for more information. Stability and performance - Includes general performance and stability improvements. The Apple TV can be updated directly on the unit by going to the Settings menu, then General, then selecting Update Software. The last Apple TV update was released back in June.